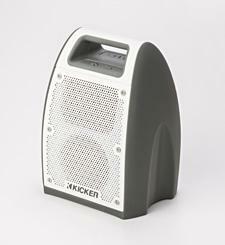 In September, KICKER will launch its new, top-of-the-line portable speaker, the Bullfrog Jump ($399.95). This powered 2.1-channel speaker features dual four-inch drivers and dual three- by four-inch passive subwoofers in a weatherproof cabinet designed to produce a 360-degree soundfield outdoors. The Bullfrog supports a wireless connection to audio sources via Bluetooth, and it has an FM tuner and an auxiliary input, as well as an auxiliary output for daisy-chaining multiple Bullfrogs together. The rechargeable battery lasts up to 20 hours, and KICKER will launch a companion iOS/Android app for setup and control. KICKER Lifestyle Products has debuted its new top-of-the-line portable audio powerhouse that plays deep, loud, and clear in nearly any environment. The waterproof Bullfrog Jump is a self-contained high-performance 2.1-channel audio system featuring two 4" drivers and two 3" x 4" passive subwoofers housed in a near-impenetrable cabinet that is specifically voiced to sound great inside and even better outdoors--from tailgate parties, the campsite in the yard, on a boat, and anywhere else music and fun are welcome. Available in two color options--green/black and grey/white--the Bullfrog looks as good as it sounds. "Bullfrog Jump is, quite simply, the embodiment of KICKER's 43-year history as a leader in audio engineering, wrapped up in one of the most intelligently designed packages on the market," said Jeremy Bale, KICKER Lifestyle Products' Brand Manager. "Our design team set out to make this more than our top-of-the-line streaming speaker. From the start, our goal was to create the ultimate audio system for anybody who feels that music is as essential as food and water for their outdoor gatherings." Similar to its namesake, KICKER's new Bullfrog Jump, which is the first in a line of high-output Bullfrog speakers, creates a sound that is deep and resonant, with a sense of authority and a call to join the fun. The Bullfrog streams Bluetooth stereo audio, and it includes FM radio for when it is time to listen to the big game and favorite local stations. As powerful as the Bullfrog Jump is on its own, KICKER added Double Kick, providing an easy daisy chain option for two Bullfrogs via Bluetooth. Similarly, its 3.5mm TRS stereo auxiliary output allows for daisy-chaining multiple Bullfrog systems to accommodate any listening scenario. A 3.5mm input jack is also available for connecting a portable audio player when Bluetooth isn't available. The speaker's sonics are big and detailed, with KICKER's signature bass and full-range output. The Bullfrog fills the backyard, basecamp, and the parking lot with a 360-degree soundfield that that reaches around the listening area to give everyone the best seat in the house. Its IP66 rating means that it can stand up to nearly any type of conditions for as long as the party might last. The Bullfrog's rechargeable battery lasts up to 20 hours, with average listening, and there is a dedicated USB charge-out port to ensure that mobile devices have the energy to keep up with such a powerful system. An easy-carry handle makes it convenient to bring Bullfrog Jump wherever the party happens to be. KICKER is complementing the rollout of the Bullfrog with a new app that makes it easy for users to tailor the audio to their liking. Kicker Connect puts access to the Bullfrog Jump on any iOS or Android streaming device, with easy and intuitive control of the FM radio (including custom presets), volume, status monitor, factory reset, a searchable user guide, and wireless stereo mode setup for connecting two Bullfrog speakers via Bluetooth. Added Bale: "Bullfrog joins the ever-growing ranks of KICKER Lifestyle products by taking its rightful place at the top of the heap. Not only is it our best, no-compromises speaker to date; it easily beats the competition on every level, from performance to convenience and reliability. There is no better way to bring the music than with this powerful new system." KICKER's Bullfrog Jump will ship in September at a suggested retail price of $399.95. • KICKER's Tabor Bluetooth Headphones Now Shipping at HomeTheaterReview.com. • Visit the KICKER website for more product information.